← Bounty, bats and aliens. I am completely outnumbered. My family is sitting in a row on the sofa as I type this giggling hysterically. Steve meets my eyes over the heads of the kids and laughs at me. I have to face it. Endless clips of crazy cats, snotty babies falling face first into chocolate cakes and people constantly bouncing off trampolines and falling over plastic chairs are humour extraordinaire when you are 8, or 2 or, pointed glare in the beards direction, 47. Harry Hill can do no wrong here apparently and saturday evening is a double bill mecca. It could be worse. They could want to watch X factor…or football. It has been the MOST beautiful sunny day here today. We haven’t managed a jot of DIY but I’ve done a bit of digging and bought some more seeds. I have a supply of toilet rolls and tomorrow Zeph and I are planting peas. Sweet and otherwise. Yay! I left Steve trying to get Ida back into the pushchair with reason (ha! sucker!) and with an airy, “I’ll only be a minute” I sprinted into MiJu, the new wool shop in Gloucester. It’s very lovely and stuffed full of tempting wool and the woman behind the counter is incredibly helpful and friendly. They do a knit and natter meeting on Thursday evenings but I’m slightly intimidated. I bought some smaller needles and this scrumptious (expensive) wool with the idea of knitting Ida a rainbow tank top ish thing. I lost my heart to a beautiful one in a shop in Cheltenham that I absolutely couldn’t justify the cost of and Ida is really very small. 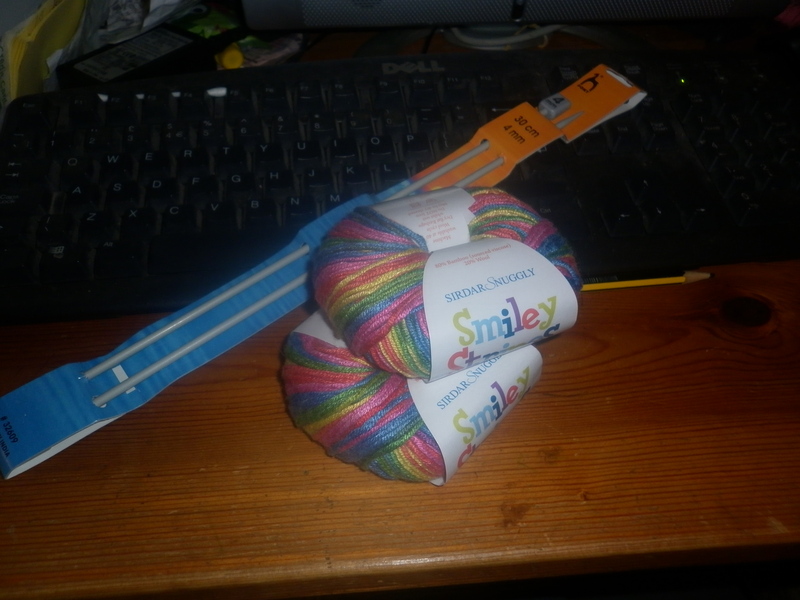 Surely I can bodge this in stocking stitch…. We shall see. When I emerged sheepishly Steve gave a small pointed lecture about wasting money on wool when I have just received an enormous bagful. I pretended it was only 10p a ball, lovely shops should be supported, this wool is stripey, I may make something to sell and turn a profit, don’t I deserve anything for myself? and finally, trump card, there was an email from amazon this morning saying his order (clenched teeth, raised eyebrows) has been dispatched. Game, set, match. Top BT’s today; my wool :), Ida trying to catch the coloured light from the sun shining through the stained glass windows at the cathedral, Zeph laying the table for tea without asking, Ida saying as we climb the stair for an emergency bath this morning, “it was that mushroom mummy” and shaking her head ruefully like an old woman. Banana and peanut butter milkshakes at teatime. This entry was posted in Uncategorized and tagged Beautiful Things, craft, homework, knitting, laughter, parenting. Bookmark the permalink. That wool is so beautiful I need some too. I’m supposed to be knitting an outfit for one of Aiysha’s bears (pink). Hope she doesn’t mind clothes made of squares. I’ll come to knit and natter with you. It sounds wonderful and maybe I will remember how to read patterns, without my great Nanny helping me. mmmmmmmm that yarn is lovely might have to get some of that. I’m up for knit and natter with you if you need company. We can run away to yarn time leaving dads in charge of kids…hurrah! let me know!